Disasters. They happen. In personal lives, and in business. That’s not being negative, that’s being real. Every day disasters affect families and businesses somewhere in the world, but it always seems to happen to someone else, doesn’t it? Then every once in a while something happens a bit closer to home—a disaster hits someone you know, and it’s a sobering reminder of what could happen. Often that’s followed by a saddening story of how they were unprotected and unprepared. Their life or their business is devastated. They’ve lost everything. Disasters are like lightning strikes. They happen and they’re random. So, in many ways, it’s wise to accept that disasters are inevitable. But—and here’s the key point—devastation is optional. Especially in relation to businesses. That’s why every business—whether large or small—needs a Disaster Recovery Plan (DRP). DRPs are not only for large corporations or those businesses located in areas prone to natural disasters like floods, cyclones, or earthquakes. Ask yourself, what would happen if your customers could not contact your business for several days? What would be the consequences? Lost customers? Unhappy customers? A tarnished reputation from people complaining to their friends in social media? The good news here is that you can mitigate the consequences of such an event, through planning. This is increasingly important in a world that expects services to be always-on and where tolerance of downtime is at an all-time low. 7 days, and you’re gone. Now that’s sobering. These days in such a connected world, a disaster needn’t be a dramatic event like an earthquake, a flood, or fire, though these are good examples of potential disasters. A ‘disaster’ can refer to any negative event that seriously impacts your business. It might be a long outage, equipment failure, or being hacked, for instance. What you need to do is make sure that ‘disaster’ does NOT refer to your reputation or your sales figures! So how will your business respond? 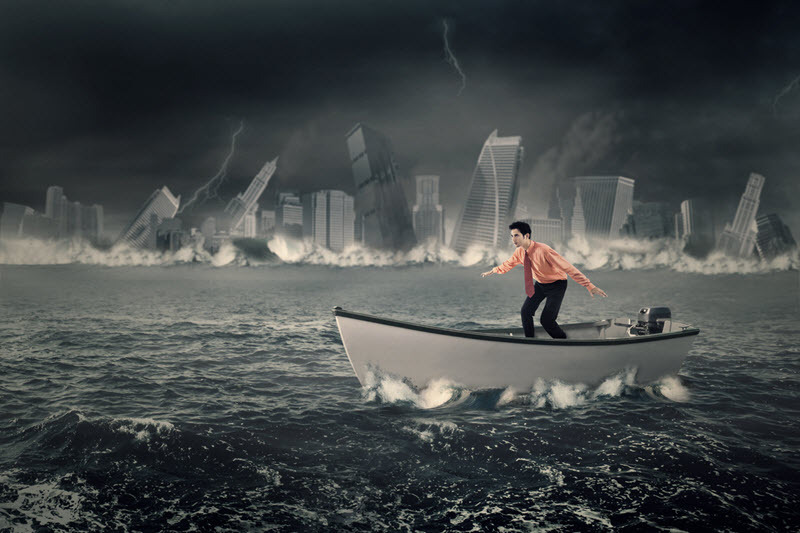 Below are five steps you can take to ensure that you survive a disaster… and enable the mission-critical elements of your business to resume as quickly as possible. The first step is to detail the basic information that everyone in the company needs to know if there is a disaster. Create a manual that provides an overview of the main goals of the plan, so that everybody is clear on its high priority status. In it, stress the impact that a disaster could have on the business, focusing on the mission critical elements. This important first step will involve internal meetings with key personnel where you assess what is most at risk, establish critical systems/functions/processes, and decide who should do what in the event of a disaster. Remember that DR may involve hardware, software, networking equipment, power supply, internet connectivity, and testing. Detail all these elements. Make sure that you list everyone who would need to be contacted in an emergency, and include out-of-work contact details. The list should also include emergency management agencies (if applicable), along with major clients, contractors, and suppliers. List the responsibilities of each employee and detail the required order/timing of each response: the most important emergency response actions should be listed first. This will likely depend on your assessment of costs/impact undertaken in the first step. Include a diagram of the entire network and recovery site to help people visualise what needs to happen. Provide maps and directions if necessary. Also include any necessary safety elements for your employees. You need to protect against injury on the premises and consider their ability to return to work after a disaster. It’s important to make all instructions as clear as possible so that people understand their roles in full. Include documentation from equipment vendors if necessary. Your disaster recovery plan is not complete without comprehensive testing. Many things can go wrong and it would be no use if it failed in the real world – so test it for gaps or elements that could be improved. This will provide valuable emergency training for your staff. Create a training schedule and ensure that everyone attends by avoiding scheduling conflicts; test the response to a dry run of a disaster and measure what works well and what can be improved. Report back on this and test again if any changes are implemented. Prevention is always better than cure. With data playing such an important role in most businesses these days, the need to regularly backup client data is not negotiable. Even if compliance regulations don’t demand it, you must ensure that your client’s confidential data is backed up online and offline. The data should be accessible from outside your normal place of work. Consider the potential cost to your business’s reputation if you experienced a data breach. By adequately planning to avoid a disaster such as this, you will minimise the threat. If your business would be incapable of operating close to normal without emergency office space, consider an arrangement for backup space in another location to your main office. While this may sound expensive, some firms provide this service specifically for small business budgets. This would provide a means of accessing key data and remaining in communication with customers and suppliers in the event of a serious physical disaster like a flood or fire. So what’s your next step, before you take these five…? While a disaster recovery plan may sound like a large undertaking for a small business, the consequences of not having one do not bear thinking about. Remember that the majority of businesses that fail to respond well to a disaster situation end up going under. Your DR plan should be a ‘living’ document that is updated regularly with current information on the steps that need to be taken in the event of an emergency. If you would like help in putting a disaster recovery plan together for your business, one of our professionals can help you out. Get in touch with us here: 07 3421 3421. With over 20 years in service, the trusted accountants at McAdam Siemon offer an extensive and diverse range of business advisory services, guidance on personal tax and financial planning matters, and fixed fees and bonus business strategy sessions with bookkeeping and tax services package.